I wish. Unfortunately, the interpretation of 2:106 which a cornerstone in our message is at stake. We agree, I think, that what 2:106 refers to is that the Quran abrogates the Old Testament. No? If so, a question that may rise in the minds is: why? Why was that necessary? God can do whatever He wills without having to explain why. Different people and times require different messages and laws. Both answers are valid, but only the first one is what is actually stated in 2:106. 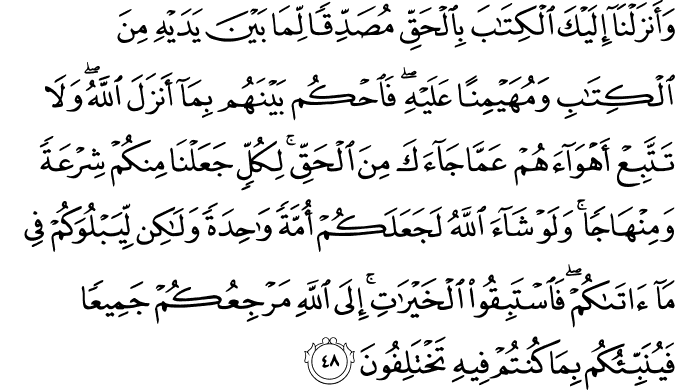 The second is implied from other verses. The structure of 2:106 is that of a rule of God and a statement of His ability. That is, if God were to ever replace or cause to forget any of His signs, He would bring a better one because He can. That structure does not prove that abrogation of prior scriptures has happened, only that it could. I'm not intellectually averse to the notion that prior scriptures were abrogated. I just don't see it being necessary or relevant to the abrogation doctrine. Because what the Quran (and the Gospel for that matter) abrogated is the Old Testament, not the Torah. The statement Jesus (PBUH) is quoted saying, in 3:50, to the Jews makes it clear that he has come to confirm the Torah. If that's all, then why is he needed? The answer to that is because the Torah was edited by the Children of Israel and became the Old Testament. The job of Jesus (PBUH) was to reset the message of God which the Israelites have altered. Jesus came to annul what has been added to it, restore what has been deleted from it and reset what has been changed in it. That is what naskh is. And Prophet Muhammad (PBUH) is instructed in the Quran to make the same statement about the Quran restoring the Torah and the Gospel and confirming them. I find it indisputable that previous books, in their original uncorrupted version, mandated fasting that is not our Ramadan fasting, and that such fasting is not mandated on us. You mentioned this example before, but we don't really know that, do we? Where is the authentic text that says so? I'll concede that this is likely the case, but hardly indisputable. In absence of authentic proof, I don't think that this example can be effectively used. We're merely presenting a plausible interpretation of 2:106, agreed with by a large number of scholars, that diverts the discussion from the abrogation doctrine, because the abrogation doctrine basis does not automatically follow from such interpretation without additional evidence. it is worth looking at this verse (22:42), as the object of abrogation in it is not a verse, but what Satan injected. I didn't get your point here. Please elaborate. One more point. I thought the verse 22:34 provides further evidence of abrogation between different messages, and makes it clear that this does not contradict that it is the same Lord who had different dictates. Then again I am already convinced of that. My humble reading of this verse is that God, in His mercy, did not leave any community unguided. He told every community, by way of scripture or prophet, how to thank Him for His bounty of livestock. The verse does not say that the method is different for each community. We have no way of knowing if it was. I see the words "your God is one God" implying that the method was the same. I see the words "but He wanted to test you in what He has given you" as the reason for not sending one scripture and law to all humanity once and for all. God allowed the Torah and the Gospel to be edited by people. Perhaps He wanted humanity to know that they cannot be trusted to keeping His scripture or following His law. Perhaps the state of human civilization was not conducive to such revelation and only when it was did God reveal the final message of the Quran. Just a thought. The object of abrogation in 2:106 is a verse. In corrupted versions, as in 22:42, the object is the corrupted injection, not the verse. I am substantiating that what was abrogated per 2:106 is the original, not the corrupted, version. But I can now also see the argument of the believers in the abrogation doctrine as follows. Based on 2:106, the original scriptures of past were abrogated, not the edited one, for God would not call man-made scripture a sign of His. Why were they abrogated? According to 2:106, because God can and whenever He does He brings an even better sign. With that established, it stands to reason then that God may also abrogate equally good signs at will. Hence the abrogation doctrine! So, what would you say to that? While irrelevant to the abrogation doctrine, the notion of whether the Quran may abrogate the Sunna is an interesting one. Dr. Husayn Nassaar addresses it briefly in his book الناسخ والمنسوخ في القرآن الكريم, page 56. He says that scholars differed on it. Some rejected it because, they said, the Sunna explains the Quran, so how can the explained abrogate the explainer? But the majority allowed it for rulings only. I agree. That said, some of the examples they often quote are inaccurate IMHO. They often give the example of abrogating the fasting in `Aashuraa' by the fasting in Ramdhaan. But fasting in `Aashuraa' was never a mandate. There is no narration from the Prophet (PBUH) that tells of a punishment if Muslims fail to fast those days. There are no explicit words of mandate in any narration about `Aashuraa', while there are explicit words of mandate about Ramadhaan, as well as countless hadeeths warning of not fasting it without excuse. It is amazing that a scholar accepts that the Quran may abrogate itself but not the Sunna. The problem is not abrogating a verse per se. The problem is leaving a verse in the text of the Quran that is abrogated without designating it as such. There are (somewhat suspect) narrations about verses that were gone from the Quran. While I doubt it, it is out of the scope of the thesis we are making (however tempting it is to refute it). The reason I am at ease with the notion (at least at peace with it) is my not-so-popular view of the dynamic phase of Islam. Patently, commands were changing over time, through adding commands such as prohibition of alcohol, the female slander ruling, and even the fasting. It is not fundamentally different if subtracting commands also took place during that phase. May have happened, or maybe not. The key is that the text of the Quran cannot contain such commands. Patently, commands were changing over time, through adding commands such as prohibition of alcohol, the female slander ruling, and even the fasting. It is not fundamentally different if subtracting commands also took place during that phase. May have happened, or maybe not. The key is that the text of the Quran cannot contain such commands. Many scholars thought of adding commands as abrogation, because new commands reverse the default that was there before them. That is obviously inaccurate, because a default is not established with a command. Only commands that cancel older commands can be viewed as abrogating. But subtracting commands is abrogation. I think that is fundamentally different from adding commands. I agree with you that "subtracted" commands cannot have been left in the Quran without God clearly marking them as such, because that would leave the Quran with verses which Muslims do not know whether to follow. That, to my mind, is the strongest argument for rejecting the abrogation doctrine in principle. While God has not clearly designated verses abrogated, pro-abrogation scholars have argued that abrogation did occur because of implying words, perceived contradictions or Sahaaba narrations. We have shown that implying words may mean naskh but not abrogation, perceived contradictions can easily be reconciled, and Sahaaba narrations are either inauthentic, or they too mean naskh in its comprehensive sense and not abrogation. So, my humble answer to my own question is that, while 2:106 makes abrogation of any sign of God possible, proving that abrogation did happen has been guesswork. A doctrine that affects divine law cannot be based on guesswork. I am in agreement with this post as it relates to verses in the text of the Quran, which is the object of our thesis. Remind me again about the distinction you make between naskh and abrogation? If it relates to the question that some sahaba (e.g., Ibn Abbas) have used the word naskh to mean something other than abrogation, it probably is best to find an English word that captures how they perceived the word naskh and use that. For example, we can say "modification not abrogation" rather than "nashk not abrogation." The use of transliterated Arabic words can lead to unnecessary arguments.